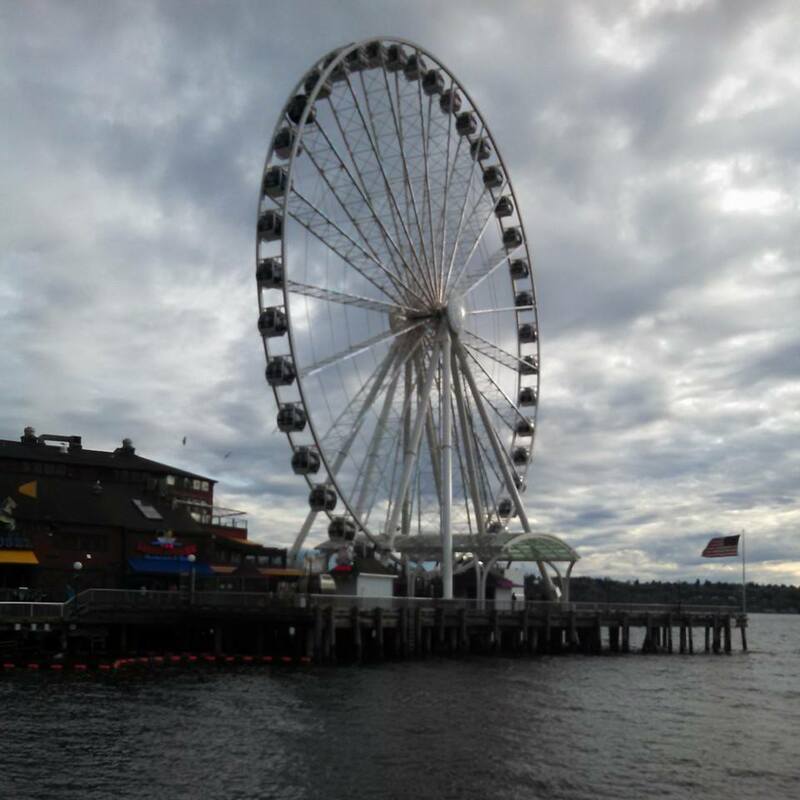 In an effort to get it all down in print before I forget everything, here is part II of our Seattle adventure. Pleased with ourselves for having squeezed in so much in our first full day in Seattle, we made an early start the next morning. Not that it’s hard to do when you are used to eastern standard time and you’re staying on the west coast. We went down to the handy dandy concierge (gotta love a 5 star hotel!) to help us with our itinerary. 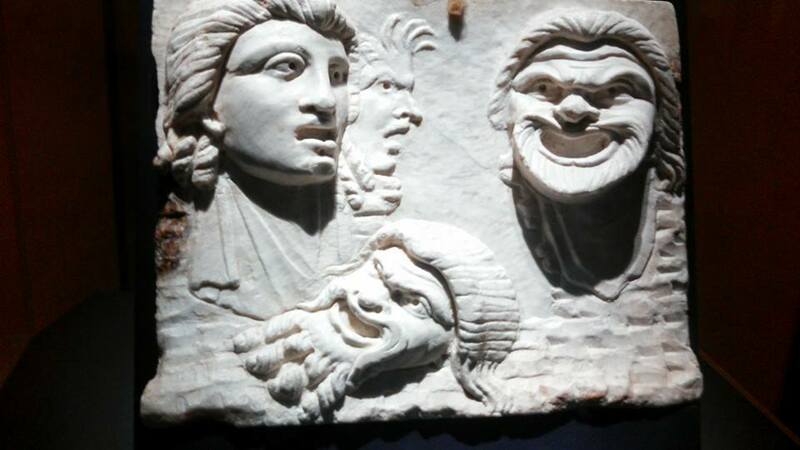 They managed to wangle passes to the Pompeii exhibit at the Pacific Center, which is something we wanted to see after the driver told us about it on the way to the hotel two nights earlier. The concierge also let us know that we could have the hotel driver take us where we wanted to go if they were available. Sweet! OK, I don’t know about you guys, but as much as I enjoy walking, eleven blocks on an empty stomach was none too appealing. And seriously, who gets a chauffeur at their beck and call? Nobody we know! We made our way down to the doorman who called the car over for us right away, just like in the movies. Hello? Black Cadillac town car with privacy screens and a guy in a uniform driving it? Heaven! My jeans and cotton sweater felt a bit casual for the occasion, but who cares? We’re in a chauffeured car! The driver was super nice, pointing out all the cool places to eat and telling us where we should go to see the best stuff, and what touristy things totally weren’t worth it. 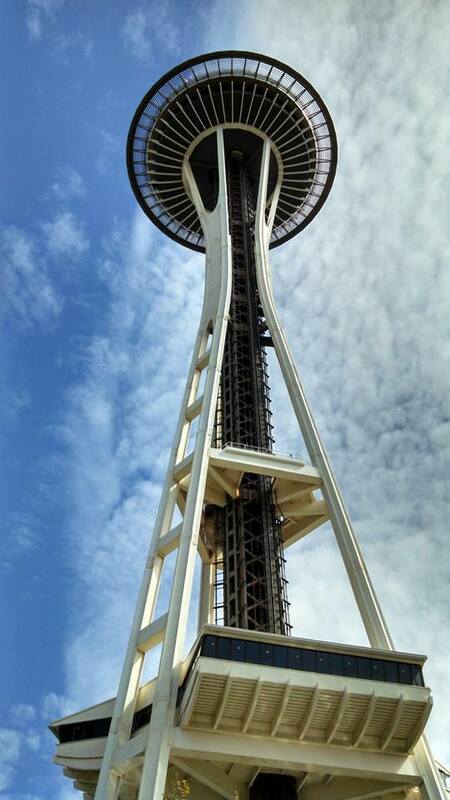 Hint, go look at the Space Needle, but don’t spend the money to go up in it. There are taller buildings with better views and cheaper elevator tickets. He dropped us off right at the Pacific Center and wished us a good day. Nice guy. It was about 9:00 AM and we noticed that not a darn thing was open. Furthermore, there wasn’t anywhere to eat nearby. Fortunately, I had my phone and we found a Subway only four blocks away so we walked over there to get breakfast and had the whole place to ourselves. Subway breakfast is pretty good. We got back up to the Pacific Center about an hour later and things were just thinking about starting to open up. After wandering around for a bit, we happened into the EMP museum and checked out the gift shop. It had a few cute things, but nothing worth dragging around Seattle for the rest of the day. Our next stop was the Pacific Center to see the Pompeii exhibit. Seeing all those marvelous things from so long ago was fascinating. I wanted to touch all the things, but of course I didn’t. But I’m jealous of all those museum employees who get to handle actual history. Being able to get close to the carvings and glasswork was amazing. I wish pieces like that were more common today. Life would be ever so much more beautiful. That exhibit was huge and totally worth the money. 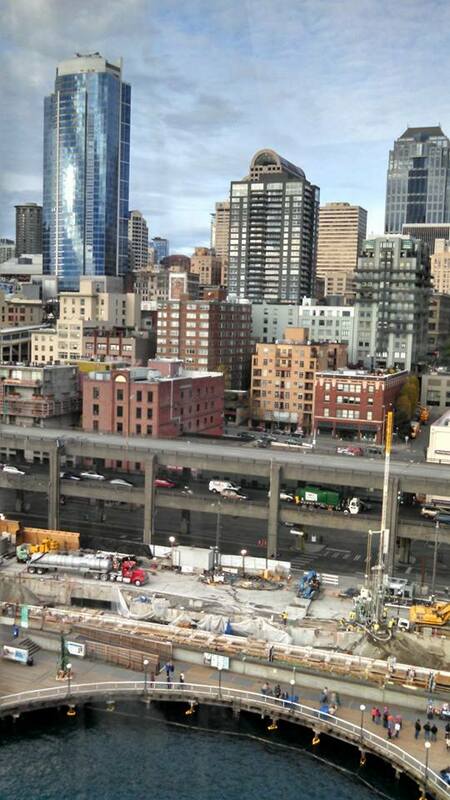 Too bad Seattle was its last stop in the US. What a treat! Since we were already at the museum, we spent some time with the regular exhibits. I wished that the kids had been there. They would have loved it, even if they are a bit too old for some of the hands-on type things. I was fascinated by the working bee hive enclosed in plexiglass. It didn’t take too long for me to locate the queen. Bees are cool, even if I am a little scared of them. One of my favorite parts of the museum was the butterfly aviary. I didn’t take any pictures of it, sadly. The variety of butterflies and the tropical plants were just stunning. I could have spent all day in there if it hadn’t been so hot. I suppose butterflies like the heat and humidity, whereas it just makes me want to find a margarita. Sadly, there were no margaritas to hand. I wonder if butterflies like margaritas? Of course, we visited the gift shop. There were tons of things we liked and would have gotten, but they were mostly not exclusive to the museum and had huge mark ups. We figured if we really wanted those things, we could search them out on Amazon later for a better price, and we wouldn’t have to trek all over Seattle lugging them in my tote bag. We visited a few of the souvenir shops in the area that we did buy some things from. After all, you can’t go away with your husband on a lovers’ vacation if you don’t bring something home for the kids, or the folks taking care of them. How is your child going to complain about only getting a T-shirt if you forget to bring home even that, amiright? 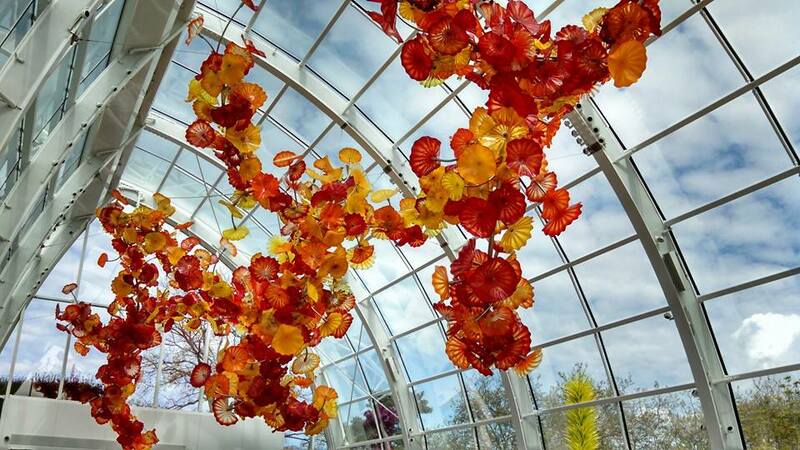 Then it was time for the #1 reason I wanted to go to Seattle – the Chihuly museum and garden! I wish I could recreate that at my house. It was so light, airy, and full of color. I can’t imagine how many gardeners they employ, but it’s certainly beyond my meager budget. 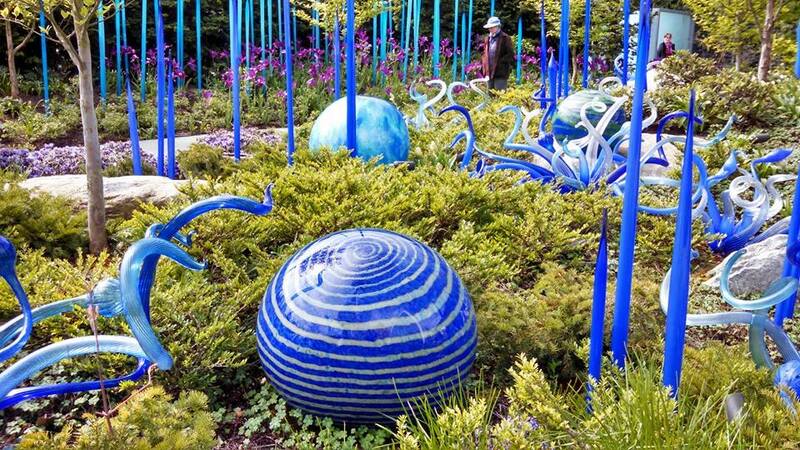 The gardens are all themed, based on the colors of the glass objects installed in each one. Everything was beautifully balanced and delightfully arranged. 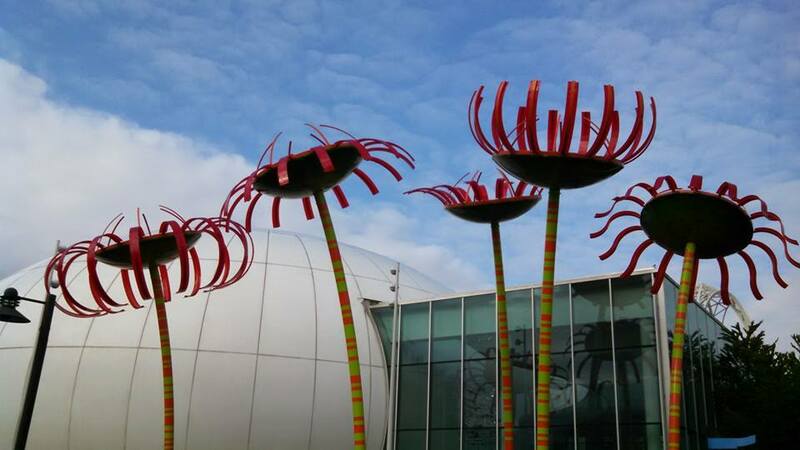 If a Dr. Seuss book was brought to life, I expect it would look a lot like that. The museum itself was awe-inspiring. The first room took my breath away. It was the size of a small ball-room and the center of it, end-to-end, featured an enormous multi-hued spectacle of shapes and colors. There was a room that had all items inspired by southwestern Indian culture, with glass imitating the woven baskets and rugs they were displayed alongside. Then there were several spectacular rooms of ocean-themed glass, followed by the Persian ceiling. My pictures do not do any of it justice. I need a new phone that can take photos in low light without blurring. Moe bought me the exhibition book so that I would have some decent pictures of the art. At this point Moe and I were getting a bit tired and footsore. We debated the merits of taking the monorail halfway back, or calling the chauffer. However, Moe found a glass-blowing shop that would be right on the way back if we walked. 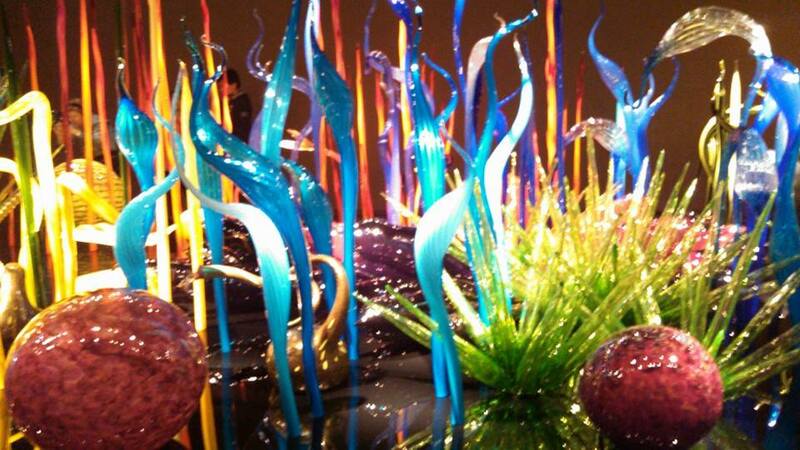 Despite the knowledge that we would have to walk 11 blocks, we decided to go to the glassblowing studio. It was totally worth it. I got to do some serious geeking and spent some time touring the hot shop and warm studio. They also had a lot of local glass art for sale. Since I was disappointed that I couldn’t afford a piece of glass from the Chihuly museum, I consoled myself with a beautiful dichroic marble from a Seattle artist. Every time I look at it I will remember what an amazing trip it was. We walked the rest of the way back to the hotel, stopping only to get some sodas and junk-food from a pharmacy along the way. After about a 45 minute rest, Moe went back out exploring, and I spent the next two hours practicing repertoire on the violin. Thank goodness for metal hotel mutes! Moe and I had a wonderful dinner that night at the Capital Grill. It was expensive, but I can’t say that I’ve had such a good steak or table service like that in a very long time. Honestly, if you go to Seattle for no other reason, go for the food. We ate our way through that city and would do it again in a heartbeat. I gained 6 pounds and have only just now lost it, and I would still hop on a plane tomorrow to dine in Seattle. One of the things my mom’s untimely passing made me aware of was how much time I was wasting. Mom worked hard all her life. She scrimped and saved so that she could have enough money after retirement to be comfortable and still indulge in her love of travel. She was able to visit Italy and Austria only a few weeks before the terrible accident, but she had so many more places to go. Mom had never been to New York City, for example. She loved travel so much that she chose a teaching job out of college that took her to Okinawa where she met my dad. When they got married she put those travel dreams on hold. Seeing the world was going to be her retirement “thing”. She waited 45 years to do it, and ended up missing her window of opportunity. You all know how it goes. We have dreams but think we have no time or money to see them through; so we leave it for some future date. “One day I will see the Grand Canyon.” “We’ll take a cruise when the kids move out.” “When I retire, I’m going to take up oil painting.” Somehow those things never really happen, and folks end up regretting that they wasted the years when they had good knees and the energy to sprint through the Chicago-O’Hare airport, or they can no longer see well enough to render a sunset. I don’t want to have regrets. 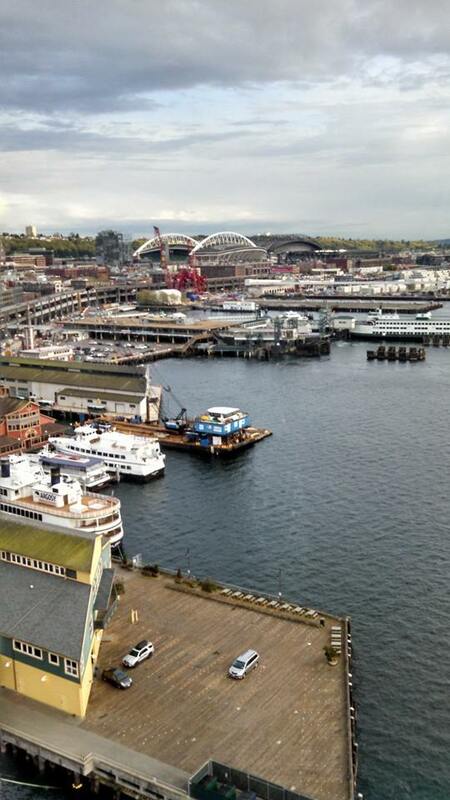 To that end, I spontaneously (for me, that is) made the decision to take a trip to Seattle, Washington two months ago. My husband and I flew out there during spring break last week. Our base of operations was the spectacular Fairmont Olympic Hotel, which I can’t praise highly enough. Honestly, we truly felt spoiled. How can you not when you have a chauffeured town car at your disposal, a concierge to book tickets and make reservations for dinner, and the most deliciously decadent surroundings to live in? Oh, we splurged! If I’m going to make an once-in-a-lifetime visit to the opposite coast, it’s five-star for me all the way! 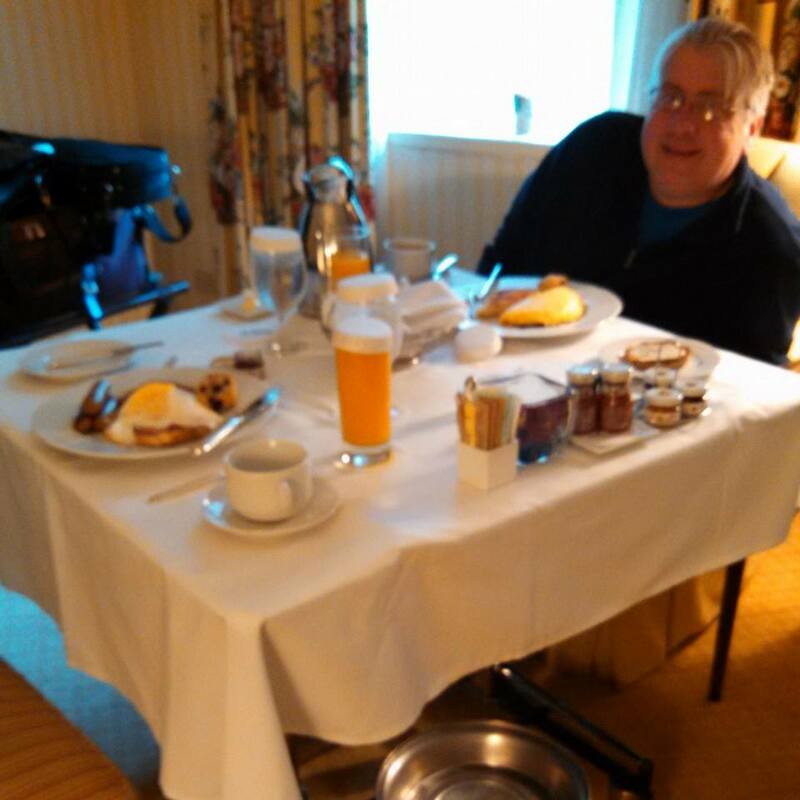 When you go, don’t miss out on the room service. It’s fantastic. My reasoning for picking Seattle was several-fold. 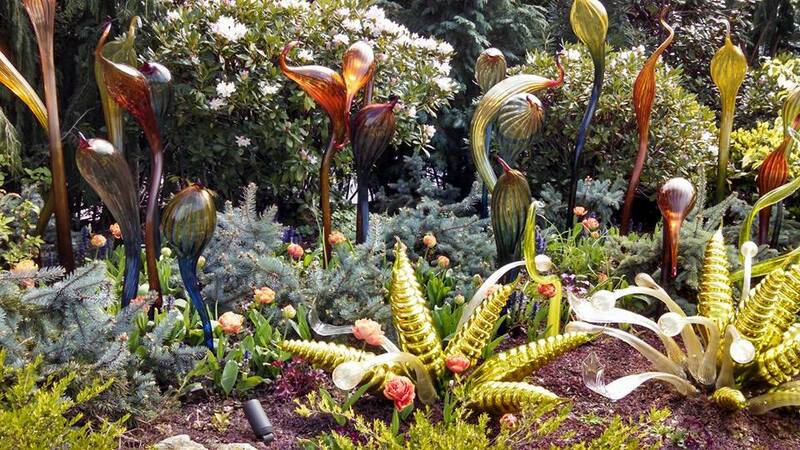 As a glass-worker, I was drawn to the ample glass-blowing opportunities, and the Chihuly glass garden. Neither my husband nor I have ever been to the West Coast. It was our first true vacation since our honeymoon as well. We have traveled for the SCA, but that’s always a working trip, not a vacation at all. I also wanted the opportunity to meet some ladies with whom I have had an online acquaintance for several years. 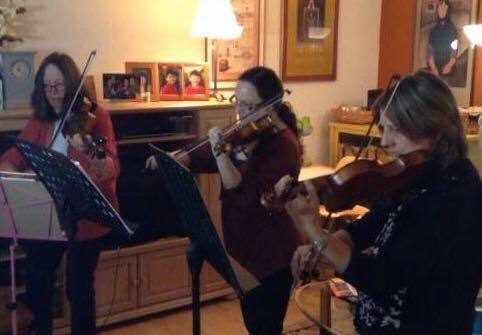 We are members of a Facebook group for Adult Starters of the Violin/Fiddle. It’s a bit of a support group for those of us who have picked up the violin for the first time as an adult, or have taken a significant break from childhood lessons. It is wonderful to have people all over the world who share our passion; because as an adult beginner, most of us are too new to be very good, and no longer cute enough to make up for the lack of skill. Although some of us are quite adorable, and more than a few have achieved a remarkable level of ability on their instruments. The first evening there we found ourselves in the hippest, trendiest bar I have ever been in. It had a sunken conversation area around a shiny, modern fireplace, and was all chromed out, with fringe everywhere. Not Mexican tour bus fringe – more like swingy, single layer 20’s fringe from ceiling to floor. The drinks were excellent, and our appetizers so good my mouth is still watering. BTW, brie and apricot preserves are fantastic together, if you didn’t know. The next day one of my online buddies picked us up for our violin date. We met at the home of one of the other ladies and spent the next several hours sight reading duets and trios. I had an absolute blast! It was so wonderful to have the opportunity to fiddle around with some of my violinistic peers in a no-stress, open session. We each brought music to share and just played for the sheer fun of it. Playing with others is simply the best. I’m so grateful that these two strangers were willing to take a chance on me and arrange that session. I hope they enjoyed it as much as I did. Afterwards Moe and I wandered down to the pier to take in the sights. We chose not to go into the Aquarium, but I really wanted to ride the huge Ferris wheel. The first go round was really scary, but on subsequent ones we relaxed and I got some decent shots. There’s much more, but this post is too long already. I’ll try to post more later.